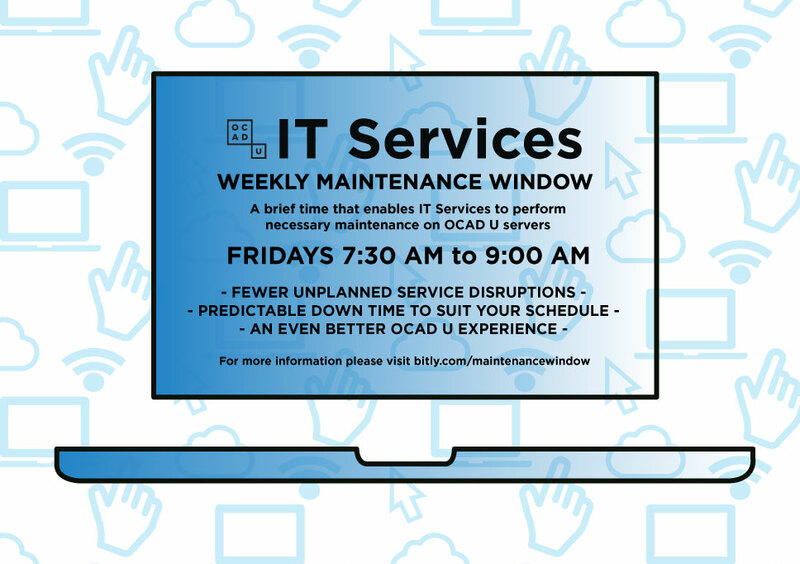 This brief weekly time slots helps IT Services ensure that OCAD U servers are patched, secure, stable and up to date with predictable and minimal down time. For more information on what IT Services supports, please visit the OCAD U IT Service Catalog on the OCAD U website. Regular IT system maintenance will be scheduled on Friday mornings between 7:30 am ­- 9:00 am. Notifications will be provided one week in advance, with a reminder the day before the maintenance. Specific services that may experience disruption during a given Friday morning maintenance window will be identified in the communications. IT Services will minimize downtime for services through effective planning and consultation with end users. OCAD U IT Services supports and hosts over 200 servers in the OCAD U data centre. Multiple Windows, Linux, Apple server, application software updates, and patches are released monthly. In order to secure and maintain OCAD U servers, providing essential services to the university community, it is very important that system and application patches and updates be current. Installation of updates and patches typically requires between 15 minutes to two hours, during which services may be disrupted. Installation of patches and updates are reviewed by the IT Services Change Advisory Board to ensure adequate assessment, end user communications and back out (undo) plans are in place prior to installation of any patches or updates that might impact service delivery. Major software or system upgrades to enterprise applications, not addressed through regular maintenance, will be planned, implemented and scheduled separately from the Friday morning system and server updates and patches. Emergency maintenance will be scheduled as needed to address urgent issues. Regular patching should minimize requirements for emergency maintenance. An ongoing communication plan will be implemented to ensure the OCAD U community is made aware of service disruptions related to IT enabled services.